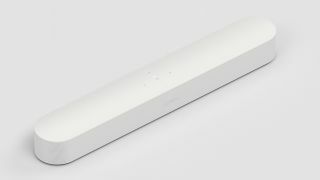 Sonos Beam among five soundbar and soundbase What Hi-Fi? Award winners | What Hi-Fi? Soundbars and soundbases continue to come to the rescue of those that want immersive, exciting sound quality from their big-screen 4K TVs but don't have the space (or budget) to install a 5.1 surround sound system. You'll find familiar faces amongst this year's five Best Buy winners, but we'll start with the new entry first: the Sonos Beam. Coming in at a modest £399, Sonos' compact soundbar cements its place among the cream of the 2018 crop by delivering immensely open, bigger-than-it-looks sound quality with a generous dash of deep, powerful bass. It even packs unrivalled multi-room streaming features, voice control and the all-important HDMI input. It's easily the best performance-per-pound product Sonos has ever produced, and will completely transform your TV-watching experience. A worthy winner. On the more affordable end of the scale, the Yamaha YAS-207 continues to be our top budget choice for soundbars under £300, while the compact Q Acoustics M2 is our sole soundbase winner at a similar price for a second year running. The stylish Dali Kubik One once again runs away with an Awards trophy. Its £799 price tag might seem a lot for a soundbar that doesn't have the streaming features of newer rivals, but the Dali still sounds absolutely spectacular. And finally, Sony's HT-ST5000 Dolby Atmos soundbar has become even more appealing than it was last year thanks to a welcome price drop. Now available for £1199 (down from £1500), the bar/sub combination's immersive performance (helped by a convincing Atmos effect), stunning insight and powerful bass will make watching 4K Blu-rays at home a delight. So there you have it - four soundbars and one soundbase that have won us over in 2018. All that's left is to announce is which will be our Product of the Year - you'll have to wait until the night of Wednesday 7th November for the big reveal, so stay tuned.